This is a short history of this famous bass so we cannot describe every change and modification that was made to it over the many years it has been in production. Nor is it possible to discuss all of the many people and companies who have contributed to its passage through history. The bass was designed by Walter Höfner in 1955 and first shown to the public at the Frankfurt Musikmesse in the spring of 1956. It seems that Walter's intention was to produce a bass guitar that would be appealing to players of the upright bass (double bass) who no longer wanted to carry such a big heavy instrument around to play in beat and jazz groups. He also designed the bass so that the construction method would be familiar to the workers at Höfner who had been making violins for decades. So we got a bass that has the style and shape not unlike a classical stringed instrument and built in much the same way, hollow bodied, arched topped and a set in neck. Walter used components from the Höfner electric guitar line and adpated these for the bass, so it got the familiar ebony bridge, the wire tailpiece, the oval control panel, the black bar pickups. He had used all of these on his Club guitars the year before. The prototype Violin Bass in 1955. It differs slightly from production models as it has a black scrachplate and control panel and the logo on the body is on the upper bass bout, not under the tailpiece. The headstock shape also appears to be slightly different to the final production design. The Violin Bass gets its public debut at Frankfurt Musikmesse in 1956. It is on the end of the front row with a Höfner 126 (Club) guitar to its right. At the table is Wanda Höfner (Walter Höfner's wife) with, presumably, a customer. Today we don't know if anyone paid any attention to the new little bass. Perhaps they did as an electric bass guitar was, in 1956, quite a new thing! From its birth in 1956 the 500/1 Violin Bass has undergone many changes. These have almost all concerned hardware changes, the body remaining virtually the same, while the neck has became slimmer. The following is a brief summary of the changes made. The first batch of basses had the pickups "wide spaced", that is one by the neck and one by the bridge. Either in late 1956 or early 1957 the bridge pickup was moved up towards the neck. We don't know why this was done, presumably to improve the tone. The oval control panel changes to the rectangular type. 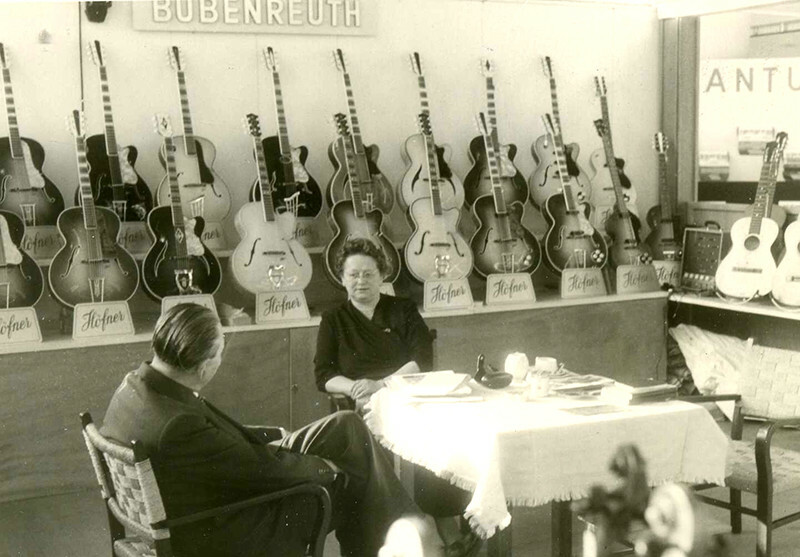 This change was made on all Höfner guitars and basses from 1958 onwards. The "black bar" pickups change to "Toaster" types. Truss rods now used in the neck. The "Toaster" pickup is replaced by the "Cavern" type pickup. The control panel uses cream pearloid and the pickguard changes from tortoiseshell to cream pearloid. Laminate tops instead of solid tops start to be used. This is the famous "Cavern" bass - Paul McCartneys first Höfner in 1961. The "Diamond Logo" pickups are replaced by the "Staple" type. Two piece necks start to be used, but not on all basses. Single tuners start to relace the 2-on-a-strip type. 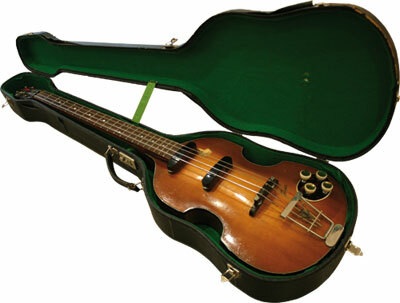 Paul McCartney got his second bass in 1963. He still uses it at evey concert. The control panel gets bigger. The pickup mounts change to a type making height adjustment easier but this means the top has to be routed to accomodate the pickups. A shorter tailpiece is now used, this being common to the Club bass also. The pickups change to the "Blade" type. New enclosed type tuners are used. By 1968 the raised logo will change back to a decal in gold. Metal tuner buttons are starting to be used. The switches on the control panel change to thinner black type. Some basses have the Höfner logo on the pickguard. Head logo changes to silver script decal. Knobs on control panel change to black type. Höfner logo stamped on the pickups disappears. "Blade" pickups changed to the 1965/66 type on some basses. Control panel remains the same. "Blade" pickups once again used. Pickguard is screwed to body top instead of using fixing mails.Pearloid is supplied from Japan as German source is no longer available. During the late 1980s and early 1990s pressure was put on Höfner, from Japan and the USA, to produce a "copy" of the 1963 bass as used by Paul McCartney. This was not, however, such a simple task. Most of the original suppliers of parts in the early 1960s had disappeared so a number of components were unavailable. Even the pearloid used for the control panel and pickguard could not be obtained. Höfner did their best to satisfy these request and a number of variants were produced for the Japanese market. None however, was exactly like a 1963 bass. Around 1990 a British guitar dealer became involved as they wanted to produce a replica of the 1961 "Cavern" bass. They worked along with Höfner and in 1992 the first re-issue basses were launched. This was the H500/1-61 model, also known as the V61 Cavern Bass. And so began the re-issues. Whilst the V61 "Cavern" was being developed with Music Ground Höfner were working on producing a bass that would be similar to Paul McCartney's bass. The outcome was the V63 re-issue, launched in the early 1990s. 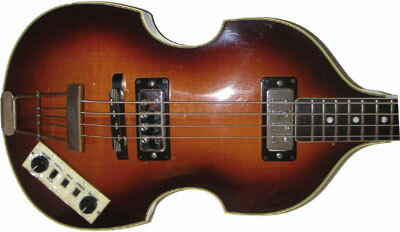 This was an excellent bass, but the specification was not the same as McCartneys. Further work would be required before this was achieved, with the V62 eventually launching.